Rowdy Belle might have a long way to go before she catches up to Black Caviar – another 24 straight victories to be specific – but all you can do is win and this exciting 2YO did just that at Werribee yesterday, taking out the IRT International Breakfast With The Stars Maiden Plate over 1118m - with over a length to spare. 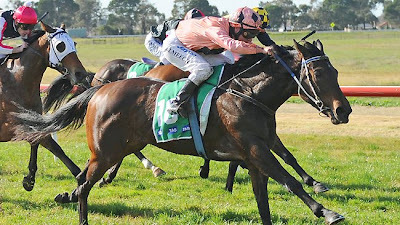 Snapped up by Moody at last year’s Melbourne Premier for $180,000 ($30,000 less than he paid for Black Caviar at the same sale four years earlier), Rowdy Belle is out of the Brief Truce mare, Quiet, a winning half sister to stakes winners Time Off and Grandiloquent. There was another big difference between Rowdy Belle and her famous paternal sibling: as they retire the number of famous players, so too did BC’s owners when it came to some of the most famous silks in racing - instead of salmon and black spots, it’s salmon and black diamonds. As we say, a long way to go, but it certainly was a sparkling performance. While the Black Caviar ‘connection’ obviously steals the spotlight, it was also another notch in the girth for Bel Esprit with Rowdy Belle being his 12th individual 2YO winner for the season, placing him equal fifth on the Leading Australian 2YO Sires by winners.